This year the spruces have a quite nice crop of cones. The second litter of squirrels is born in July. There are four to five young cone kings in the nest. To start with they are blind and naked, in August the eyes open and already in September they start an independent life and preparations for winter. 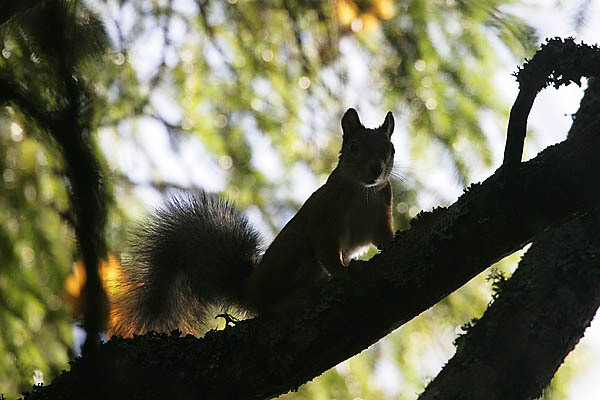 Squirrels are omnivores, mainly feeding on plant seeds, spruce cones, towards autumn on acorns, hazelnuts and mushrooms; nuts and acorns are collected for winter stores. The period for preying on bird chicks is past, the squirrels search for insects and snails in trees and in the detritus on the forest floor.